With Little Spaghetti's first birthday party just days away (are you sick of hearing me talk about it yet? ), I was working this morning on a "Happy Birthday Banner." I ran out of brads, and when I looked at where I was, I thought to myself, "This is the banner I needed on this day last year!" And then it hit me: My baby is one year old. Or just about. I know this is so cliche to say, but I cannot believe how fast this time has gone. My baby isn't really a baby any more. I'd been planning to use this week to blog about Little Spaghetti's entry into this world and first few weeks of life, but I've simply run out of time. Oh well, there's always next week (I may even get brave enough to share the birth story...). "I hope you Dance" by Lee Ann Womack (or if you're in the mood for funny instead of tear-jerking, check out Momisms by Anita Renfroe). I love you, my sweet baby boy. With all the party preparations I've been doing lately, I've been completely neglecting Easter. My decorations aren't even out, yet. I'm starting to see sock monkeys in my sleep, though. Ah well, after this weekend, I will get myself together! My first memory of Easter is when I was about four years old. We lived in a little town in the mountains, and we weren’t surprised to find the ground covered with snow when we woke up Easter morning. I have two sisters, and I’m the middle child. We all got dressed in our pretty little white lace dresses. My mom brushed our hair, and put on our big-rimmed bonnets. We picked up our Easter baskets: my older sister’s purple, my younger sister’s pink, and mine green because we couldn’t find a yellow one, which was my favorite color. Then we put on our little white dress shoes. Mine were hand-me-downs from my sister, and they were a little bit too big. But I loved dressing up for Easter, so I didn’t care that they’d slide around a little. We went to church, and after church there was an Easter Egg Hunt. I’d been looking forward to this Easter Egg Hunt for weeks: the frenzy, the searching, finding little treasures inside those beautiful pastel eggs. I was antsy all through the service thinking about it. The hunt was done in stages, based on age. Youngest kids first to find the easiest eggs, and older kids last to find the ones that were really hidden. I was in one of the first groups to go, and before me stretched a snow-covered field dotted with pink, orange, green, yellow, and blue eggs. I couldn’t wait for the whistle. “Tweeeeeet,” it finally came! I was off and into the snow. And then. I was stopped. I watched the kids all running around me, gathering up eggs and filling their baskets, but I couldn’t move. My slightly-too-big shoes had popped off. One. Two. The first two steps I’d taken in the snow. And I was standing there in my stocking feet, freezing my little toes off, trying to find my lost shoes, and missing the entire hunt. My mom soon came to my rescue, but by the time my shoes were back on, the Easter Egg Hunt was over, and it was time for the next round of kids to have a turn. I cried. My older sister’s turn came, and she ran around, collecting up eggs. When she got done, my mom – like any good mom – told her she had to share with me and my younger sister (who was too young to participate). We each got to pick a few eggs out of her basket for ourselves. This would have been all well and good, except that inside one of the eggs my little sister picked out, she got a paper with a number instead of jelly beans or chocolates. The paper meant she’d won a special prize: one of the candy baskets that had been donated by the Hallmark store in town. My mom went with her to pick it up. When they brought it back, it was the biggest, most colorful candy display I’d ever seen in my life. Talk about salt in my wounds. I cried harder. Of course, we all shared the chocolates, but they weren’t mine. My older sister had a whole basket of eggs she’d earned herself. My little sister had more candy than she could ever eat. And I had a measly three eggs and some candy donated to me out of pity by my parents. But you know what my favorite part of Easter is? Easter Egg Hunts. And white party dresses. And slightly-too-big, hand-me-down shoes. It’s the traditions that make a family. I may not have appreciated it at four years old, but now, as a mother myself, I know that. I’m looking forward to Little Spaghetti’s first Easter, and I hope I can make his Easters as special as mine were. Maybe without the feet in the snow part. I hope all of his holidays are filled with love and family, wonder and a little bit of magic. What's with the sleep crawling? Oh sleep...Why must we have such a tortured relationship? Why can't we be friends like we used to be? Sleep and I haven't been getting along for the past...year or so. It seems to have had something to do with the birth of a certain little guy, but I'm not looking to point fingers today. Today I'm mourning the loss of the little bit of sleep I had been getting. It's. officially. gone. The hatred of beautiful, soft (expensive) sheets was tough to swallow, my extreme paranoia of SIDS was a challenge, the nursing ALL NIGHT LONG has been brutal, but I'm at a total loss for what to do now. He just crawls...in his sleep. His eyes aren't open. He's not really awake, though he does make some whining sounds. He crawls up in between the pillows, which isn't so bad. He crawls toward the side of the bed, which causes me to worry (and not sleep, wouldn't you know?). He crawls straight into the bed posts and bangs his head. And my personal favorite, he crawls on top of my head. I try to just gently move him back into place or cuddle him next to me, but to no avail. He flails like a mad man until he has regained his freedom (and this from a kid who loved being swaddled until he was almost six months old!). Am I destined to be forever sleep-deprived? Will I ever regain my sanity? Will this child ever learn to sleep like a normal child? Any words of wisdom? Tips or tricks? Strong martinis to pass my way? 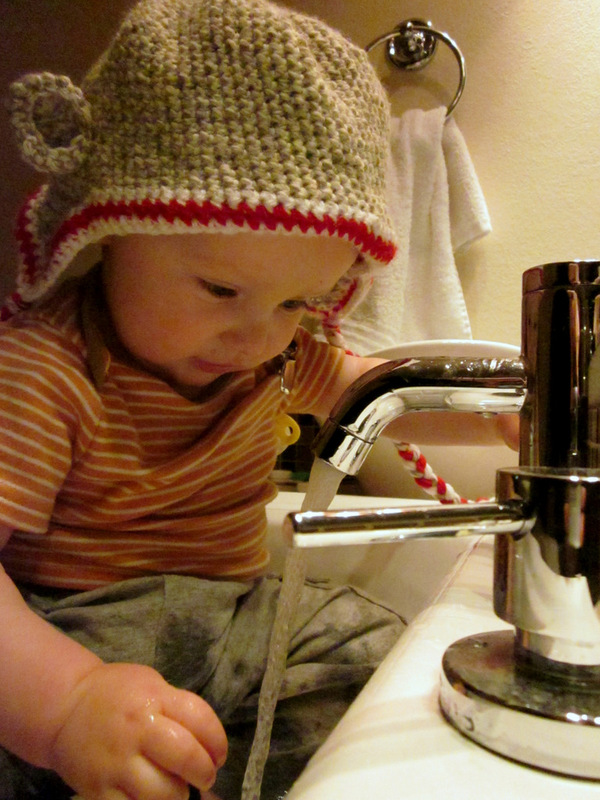 When I became a mother, I quickly learned that there is one thing that people never question: going to the bathroom. When I ask someone to watch the baby for a second so I can check my email, the reply is often, "I will in a little while, just not right now. I'm busy." When I ask someone to sit and play with the baby for a bit so I can get dinner started, I'm not surprised to hear, "Can't you just bring him in the kitchen with you?" When I ask someone to hold the baby so I can get make myself a snack, I'm usually fairly certain I'll be met with, "I'll do it when I'm done. Just give me fifteen more minutes." But when I say, "Hey, take the baby for a little while. I have to go to the bathroom." You know what? Nobody ever argues. Not once. "Sure," or "of course," they say. And so, I confess to you today that sometimes when I just need a little break, a little "me time," I sometimes lie. And say I have to go to the bathroom. Thank goodness for laptops, that's all I have to say. I never thought I'd find the bathroom floor so comfortable. I never thought I'd think of my bathroom as my respite, my spa away from the spa. Do you think anyone would get suspicious if I moved a comfy chair in my bathroom? What about you? What do you do to get away from the craziness? I've been a busy girl! I want to share with you a couple of my recent projects, but before that, I suppose I should let you in on a little secret: the theme for Little Spaghett's first birthday party. Here's your clue/the color scheme (the paper lanterns I bought to decorate with). Can you guess?? Sock monkeys remind me of simpler times. Little Spaghetti has a sock monkey that I sewed with my mom when I was ten or eleven. If you're a certain naysayer in my life (who shall remain unnamed), sock monkeys are ugly toys that only poor kids play with, and you're horrified that I would choose them as the theme for my son's birthday. (Yes, someone in my life truly said those words to me). Lucky for me, I fall into the category of people that think sock monkeys are "cute and vintage" instead of "appalling and destitute." First, I'm a sucker for aprons. They're like a supermom's cape (you know, like a superhero...just backwards). Look at all those cute little monkeys! Next, I crocheted this cute little sock monkey hat using a combination of a pattern I bought on Etsy and this pattern that I found for free online. I ended up liking the hat body from the free pattern, but I used the ears from the Etsy pattern. (I know, I know. I'm sorry for reusing the same photo you've already seen! Sadly, Little Spaghetti isn't really that interested in wearing this hat I labored over, so getting a photo of him in it is like pulling teeth). There you have it! More to come, for sure. Oh, by the way, the Emmeline apron is reversible, so here's the back. I can't wait to wear this around my kitchen post-birthday. It was a super easy pattern to follow, and I'm a serious novice when it comes to sewing. To be fair, though, the failure wasn't really mine. Mr. Spaghetti's birthday was last week, and he asked me to make him a cheesecake for Sunday. So, I stayed up late making said cheesecake Saturday night, thinking it would sit in the fridge overnight and be perfect the next afternoon. After we got into bed Saturday night, I remembered I'd left the cheesecake sitting on the counter. "Will you go put the cheesecake away for me?" I asked my husband. "Put it in a paper bag instead of wrapping it in plastic so that the water doesn't condense on top of it." The next morning, I go into my kitchen, and what do I see? A paper bag sitting on the counter. Inside? A cheesecake. "Has this cheesecake been out all night?!?" I asked. "Yeah. You told me to put it in a paper bag, so I did." Apparently, I needed to be more specific: that I wanted the cheesecake in the bag, and the bag in the fridge. Silly me, I thought everyone knew that cheesecake had to be refrigerated! 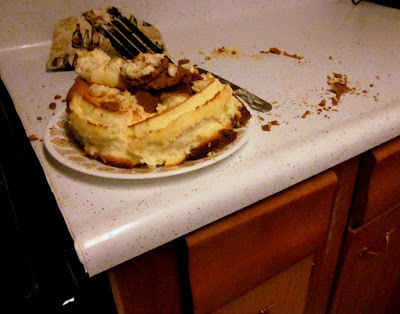 Anyway, the picture above was the result after I scooped the warm cheesecake out of the pan. I made a new one, though. Good wife that I am. 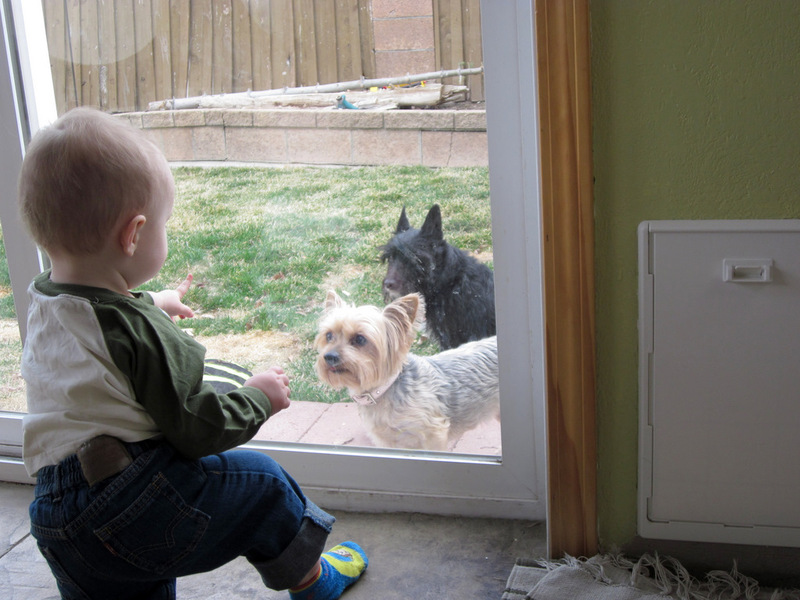 We found this little Yorkie wandering our neighborhood. I opened the door of the car to see if she had a tag with an address, and she hopped right in and sat on my lap. Luckily, she did have a tag and was returned home after just a few hours. Little Spaghetti was intrigued by her while she was with us though. Our own Noodle Dog (the black, dejected-looking one in the back) was not *entirely* thrilled, but I think she enjoyed the company, too. Little Spaghetti also learned two new tricks this weekend. He learned how to turn on the faucet. And I think he enjoyed sitting in the sink and getting sopping wet as a result. He also got brave and let Noodle Dog eat out of his hand. ...and ended up with a thoroughly exhausted baby! All in all, a pretty good weekend. Today my favorite thing is fake baby crying. I can’t help but laugh. It gets me every time. I’m going to need to learn to control that before I need to be a serious disciplinarian or he’ll never take me seriously! I have a job. And I’m not talking about the smiling, laughing, shouting, little monkey that lives in my house (though some might describe him that way). I mean a real, go-to-the-office kind of job. I sometimes have to remind myself of that. For years, I was convinced that I wanted to be a stay-at-home-mom. And there are days when I still wish I was. But the truth is, I think I have the best of both worlds. I am lucky to have a flexible employer who was willing to work with me after I had Little Spaghetti, so I only work two days a week – plus a few hours from home. And most of the time, I FEEL like a stay-at-home-mom. Either way, I have a job. Sometimes I really like my job, and sometimes I really don't. I suppose that's how anyone with a job feels, though. There's one thing for sure, though: my life in the work world means something entirely different to me as a mother than it did before I got pregnant. For me, the best thing about work, without a doubt, is the continuous blocks of uninterrupted time. This is something I took for granted before having a baby, but now it is pure bliss. Sitting, focusing, completing tasks without hearing a cry or a whine is...beautiful. Going for eight or nine hours in a row without getting interrupted by a nap cut short or a snack demand that must be filled right now is...amazing. Though that's not to say I don't get interrupted at work. They're just different, less shrill interruptions. The thing I like least about work caught me completely off-guard. As I prepared for maternity leave, the things I dreaded were feeling like I'd hate to leave my baby, feeling worn out at the end of the day and still having to cook/clean/everything else, and feeling like I was missing out on important milestones. Now, of course, I don't like any of those things, but the thing I like the least is that when I’m at work, I’m not a mom. Or at least, that’s how it might appear to anyone I meet in a given day. It’s not like because I gave birth, I was branded “Mom” on my forehead. Nor would I have wanted that. But the thought that someone could interact with me – even on several occasions – and not know such a fundamental and important thing about me seems…wrong somehow. I don’t want to sound like some crazy, obsessed mother that NEEDS everyone to know she has a child. And I don’t think that being a mother is the ONLY thing that defines me, but it’s odd to be missing such a big part of my life a couple days a week. This feeling led me to want to have some reminder of Little Spaghetti with me at work, and so I started looking at mom jewelry. I found lots of beautiful things, but none were quite right. So, I took on the task of making my own. And, I have to say, I love the results. A little something called silver clay, a cheap butane torch from a hardware store, and tada! The imprints are my little guy's toes. I love how simple it is, and I love how personal and unique it is. 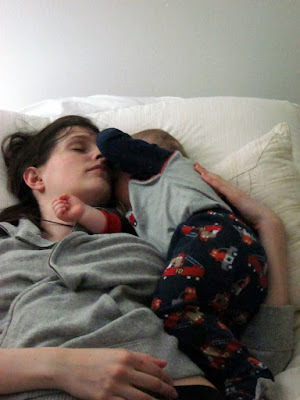 Most of all, I love that - like motherhood - it isn't "perfect." I unfortunately didn't take pictures of the process, but I'm hoping to do another one soon (I'm so paranoid that I'll lose this one that I want to have a back up! ), so I will post all the details then. Do you have mom jewelry that you love? I love finding new things to buy! I feel very lucky to have a wonderful and supportive husband. Not only that, but he provides endless entertainment in my life. Swim goggles, onion goggles...what's the difference? He says, "What's this song about? A woman that can't make up her mind? I guess it's good that he [Little Spaghetti] learns early." I guess *he* should have known what he was getting into when he married such an indecisive woman! I have a very bad habit. I drink soda. Specifically Coke or Pepsi. And I drink it a lot. I drink so much of it that it doesn't even taste good to me anymore, but I drink it anyway. You might say I have a problem. I didn't drink any soda while I was pregnant, but after I had the baby, I started to treat myself to a soda when we went out to eat. Then, I'd buy the occasional bottle to have at home. Now, I drink it more days than not (though still not EVERY day). I've wanted to stop. I've even *tried* to stop. But somewhere between the lack of sleep and the addictiveness of that sweet sugary syrup, I just haven't had the will power. Today, though, is Ash Wednesday. Which means Lent. Which means "giving something up." And for me, that something this year will be soda. I'm doing it for me and for my health, but more importantly, I'm doing it for my baby. I want to set a good example, and I don't want to be a do-as-I-say-not-as-I-do parent. Long before I had a baby, I found the wonders of craigslist. But since becoming a parent, craigslist is no longer just for the occasional antique record player or replacement small household appliance. I have bought and sold countless kid-related items on craigslist. It's not only great to be able to buy almost brand new things at a fraction of the cost, but it makes me feel better that I'm not contributing to a landfill by reusing someone else's things and by not throwing away our own. Anyone who knows craigslist knows it can be...interesting. The people you meet. The situations you find yourself in. I had one of my most interesting craigslist experiences recently. I listed for sale a convertible backpack/stroller. We'd gotten it used, and already have both a stroller and a backpack that I liked better than the combination one, so I decided to pass it on to someone else. It was in pretty good shape, but not perfect, so I listed it for $20. A woman called to ask about the stroller. I explained its features, and she asked me almost a dozen questions, among which was if it came with a sun canopy. I told her that I didn't have a sun canopy: I'd gotten it as it was, no canopy included. She asked me if I'd take less, and I agreed that $15 would be ok. I just wanted the thing out of my garage. We met up in a grocery store parking lot all the way across town from my house. It had been raining on and off, and it was freezing cold. I pulled the stroller/backpack out of my trunk, and shivered my way over to the car that matched her description. She got out, and asked me another dozen questions, told me about her kids and their plans to move to Arizona, and looked over the stroller from top to bottom. I blew into my cold hands and tried to act interested. After much hemming and hawing, she finally said, "Well, are you sure $15 is as low as you'd go? I'd really rather only pay $10. I was hoping to get a stroller with a sun canopy." "Alright," I sighed. I'd packed the thing up, hauled it across town, and stood for far longer than I'd ever wanted to in the freezing cold. I really didn't want to take the thing home with me. Like I said, I just wanted it out of my garage. This is usually where craigslist interactions stop. Unfortunately, that wasn't the case this time. Not thirty minutes after I get home, my phone rings. I look at the number and recognize it as the woman I'd just sold the stroller to. My gut instinct told me not to answer. To just let her leave a message and find out what she wanted. I should have listened. "Hi, um, I think you just sold me a stroller." You think? "Yeah?" I said. "Well, I was looking at it, and it looks like there's some loops on the front. Like something's supposed to attach there, you know. And I was thinking that maybe that's where a sun canopy goes. It looks like you're supposed to attach a sun canopy right there." Really? A sun canopy? You mean the thing I specifically told you I DO NOT HAVE. "Well," I said with as much patience as I could muster. "I don't have a sun canopy. I never had a sun canopy. Maybe you can find one online or something, but I don't have one." "Ok," she said. "It's just...well, it looks like there's supposed to be one." "Good luck," I said as I hung up the phone. I don't know what she was expecting me to say. "Oh...you mean the *sun canopy. * Right, of course I have that. Why didn't you just ask?" And why would I hold out on her? "I was just holding onto this sun canopy so I could use it on my....oh wait, no. I sold you that stroller. Well then I was just keeping it to spite you then." Seriously. There's no sun canopy. And I made that clear from the start. I sold the thing for ten dollars. It's not like I was trying to rip anyone off. I couldn't believe she felt the need to call me up and harass me at home for something I told her was not included. Ah well, at least I have a little more space in my garage. What about you? Do you have any good Craigslist stories? My little man is turning one in just over a month, and I've been working hard to plan his first birthday bash. I love throwing parties, and this one is so special to me. While I love parties, I don't love spending a ton of money on something that goes by in a flash. So, I'm taking on quite a few DIY craft projects to pull together a (hopefully) amazing party on a fairly small budget. Over the next few weeks, I hope to share lots of my projects with you. The first project is a Balloon Wreath. Balloons scream "birthday" to me, so when I saw this on How Does She?, I decided I had to give it a try. I made a few changes as I went along, so here's my step-by-step. A straw wreath (sorry, I didn't get a picture, but you can see it below). Keep the plastic wrap on. Floral pins (Walmart sells packs of 100 for $1 in the floral/crafts section). 2. Stick your balloon(s) between the prongs of the floral pin. You could stick the pin through your balloons, but I couldn't bring myself to put holes in all those perfectly good balloons. The directions I was using said to use one pin and one balloon, but I decided to group three balloons - one of each color - and stick them all on with one pin. That way, I was sure to distribute the colors evenly, and I used 1/3 as many pins. I made sure not to face all the balloons the same way, so I didn't have all three tops or all three tails in one place. I liked doing it this way because it gave the wreath a very "full" look. I started out in one spot, pinning the balloons in a group. Then I got worried that I might use up all my balloons and not cover the whole wreath. So I started pinning a small grouping of balloons across the wreath from where I'd started, then another grouping half way between each of the first two groups, essentially breaking the wreath into fourths. I continued this strategy of filling in evenly in sections to make sure I had enough balloons to go around. Here you can see my first four groups. The largest one was the one I started with before switching my strategy. Here it is as I continue filling in. I tried to make sure I pinned the balloons in a way that they covered the straw parts of the wreath on the edges, so you can't see the straw when the wreath is hanging. 4. That's it! All in all, I used about 220 balloons, and it took about 45 minutes to put it together. Pretty dang simple. And hard to screw up, which I like in a craft project. I'm really happy with how it came out, and I can't wait to hang it at Little Spaghetti's birthday party. It’s amazing the difference just a few years makes. Not just in the predictable “ I now have a baby and a husband and a house instead of a final research paper and a date at the dining hall and a grungy apartment that I share with six people” kinds of ways. Today, I’m traveling for work, and it will be the longest span of time I’ve ever been away from my baby since the day he was conceived. 17 hours. I’m waiting for a plane home now, and only have four hours of this day left, but the newborn wailing across the terminal is not helping with the super-sensitive rocks on my chest that are literally about to burst since I didn’t get time to pump today. It’s been hard. Harder than I expected. I feel out of place and uncomfortable. I feel like I’ve left for two weeks instead of less than a day. I have been striking up random conversations with women traveling with small children just so I can be near a baby. If you ran into me right now, you’d probably be a little creeped out. As I stepped into the airport terminal this morning, the very distinct smell of rubber, industrial carpet, and chemical cleaners was all too familiar. In college, I lived across the country from Mr. Spaghetti. I spent a lot of time in airports then. Airports meant something completely different to me then. In a way, they became like a second home to me. Then, that smell meant anticipation, excitement, and relief. That smell was synonymous with lustful kisses that would greet me when I landed, and the warmth I’d feel wrapped in the arms of the love of my life. Today, that smell was almost enough to turn my anxious stomach. It smelled like reluctance and worry. It used to be that I couldn’t wait to buzz through the security line, popping off my shoes and whipping out my computer to slide through the x-ray machine in a little gray tub. I navigated security with grace and ease. Today, I fumbled as I tried to get out my ID and got flustered when I found a stray rubber duck instead of my boarding pass in my bag. As walked through the terminal, I resented being dragged away from my home and my baby. It was all so familiar. The blue leather seats. The gray walls. The red and blue swirled carpet flanked by aisles of scuffed gray vinyl tiles. It was familiar all right, but for the first time I can recall, it was completely unwelcome. As I sat in the boarding area, I felt more like a woman awkwardly waiting in a doctor's office for a sure-to-be uncomfortable annual exam than like a romantic jetsetter. But I’m not complaining. And when the sweet smell of oatmeal shampoo replaces the weary stench of travel as I cuddle my baby up tonight, I'll know I wouldn’t change it for the world. Often times I catch myself off guard with the things I hear coming out of my mouth. Many of these things are not things I ever expected to hear myself saying. And certainly I never expected to be saying them in a genuine way. Yet, I've found that I've had many words of wisdom to impart to my infant over the last 11 months. Tonight, I was changing Little Spaghetti's diaper before a quick trip to the grocery store. While he tried desperately to crawl away from me naked from the waist down, I told him, "You have to put your pants back on. The world expects us to wear pants!" It ranked right up there as far as "teachable moments" go with the time when he was three or four months old and had started protesting being strapped into his car seat. In response to one particularly frustrating occasion, I calmly told him, "Look, honey, whether you like it or not, you have to ride in your car seat. It's the law. If you don't ride in it, mommy will go to jail on charges of child endangerment. And if mommy goes to jail, there will be no more milk." In response to the horrified looks on my husband and mother's faces, I said, "What? I'm just telling him like it is. I'm raising a realist, ok?"